The ModelId value tells you what you need to know. It's a reference you will find in the appropriate index.xml for the specific body part it relates to (in both these cases, resources\art\dynamic\chest\index.xml). The best approach when looking up values from Jedipedia is to use Notepad++ and its Find In Files function. Set the base search directory to resources\art\dynamic and the file type filter to *.xml, then search for the IDs Jedipedia produces. I know i'm really new/late to this, but could someone tell me what the resources folder is specifically, in terms of what file was extracted to make it, or is it just an amalgam of all the specific files extracted? thanks! Sorry, if this has already been asked or answered, but is it also possible to view complete areas / planets and if so, how? I have a new hash list that includes a lot of Ossus (PTS)! Ausar wrote: I know i'm really new/late to this, but could someone tell me what the resources folder is specifically, in terms of what file was extracted to make it, or is it just an amalgam of all the specific files extracted? thanks! An ultra-n00b here . I think it's the amalgam of all the named files in the hashes_filename, as every other folder outside it contains the unnamed ones. • What's the best way to tint objects (characters' skin hue and dyed armor) from a Photoshop's layers' transfer modes or image adjustment tools point of view, using the hue values found in the XML data? I read SWTOR fan's post about the matter, but I got utterly lost in the hueing shader code. I'm looking for a general procedure that works for everything without further per case manual adjustments, as the 3D app I own (EIAS3D. Learning Blender at the moment, too) supports texture layering with transfer modes. I'm hoping for either setting a model's diffuse color to the one specified in the XML data or some formula-calculated version and put the diffuse map on top with some specific transfer mode. Or viceversa. That, or some Photoshop image adjustment I could automate to process whole folders of texture files. • Also, what are the correct or most approximate layer transfer modes to use on the head customization maps? Specifically the Complexion, Makeup, Pattern and Tattoo maps. They seem to work well with Darken and Multiply, but if someone has the right answer it would be very welcome. Can anyone link me to the version of EasyMYP that works for this? The one that was posted originally doesn't seem to work anymore. 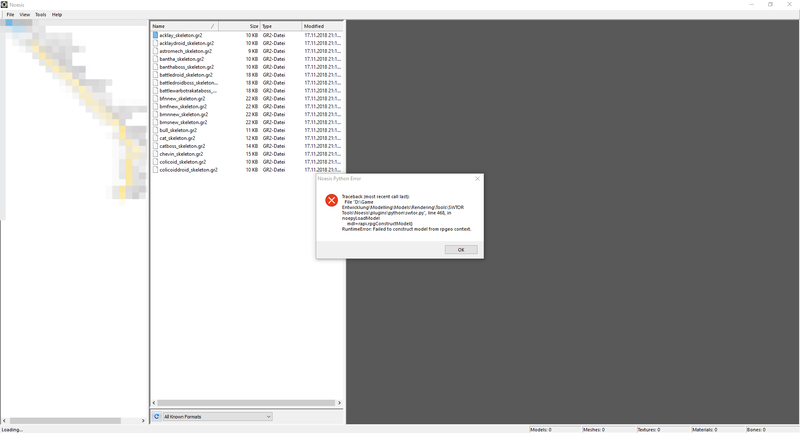 I have a new Hash-List for EasyMYP / TorMYP with over 3000 neu file names (included most Ossus 3D-Models and textures) but without Ossus dialogs! basically i worked out the usage of all tools and finally got anything i got. "_skeleton.gr2" are just bones, there's no geometry inside, you need a maxscript or other Noesis plugin for bones.